Suggested citation: Plag, H.-P. (ed.) and the Workshop Participants, 2018. Workshop Report “Implementing and Monitoring the Sustainable Development Goals in the Caribbean: The Role of the Ocean” January 17-19, 2018, Saint Vincent. GEOSS Science and Technology Stakeholder Network (GSTSN). Available at http://www.gstss.org/2018_Ocean_SDGs. The workshop on “Implementing and Monitoring the Sustainable Development Goals in the Caribbean: The Role of the Ocean” was held on January 17-19, 2018 at the Beachcombers Hotel in Saint Vincent. The implementation of the seventeen Sustainable Development Goals (SDGs) of the United Nation’s 2030 Agenda for Sustainable Development poses socio-economic and cultural problems to society that are difficult or nearly impossible to solve because of incomplete or contradictory knowledge, the number of people and opinions involved, the large economic burden associated with progress towards a solution, and the interconnected nature of these problems with other problems. The iterative development and implementation of transformational policies to reach the SDG targets hinges on knowledge derived from data related to the state and trajectory of the Earth system. Likewise, validating these policies and monitoring progress towards the SDG Targets depends observations of the human and non-human environment. The challenges faced by Small Island Developing States (SIDS) in the execution of the 2030 Agenda are closely linked with the ocean surrounding these states. Human interactions with the Earth’s life-support system have impacted the physical, chemical, and biological state of the ocean and triggered distinct trends in the ocean system and its functional position in the Earth’s life-support system. The trends in marine ecosystems, ocean circulation, the global water cycle, and sea level have many impacts on human communities and influence progress towards most of the goals. For SIDS, the changing ocean poses a complex challenge, and many of the observational requirements will be related to the changing ocean. The goal of the workshop was to better understand the role of the ocean for the implementation of the Agenda, and to identify the ocean-related knowledge needs of societal actors engaged in this implementation. The workshop aimed at linking the efforts that a wide range of stakeholders in the Caribbean SIDS are making towards the implementation of the 2030 Agenda to required ocean observations and to engage in the co-creation of the knowledge supporting these efforts. These requirements, where possible, were matched to existing data sets and services to create the knowledge needed by the governments and the people in the Caribbean SIDS, and gaps were identified and addressed where such products do not exist or were not accessible. The workshop was organized as a collaborative effort of GEO Initiatives, governments of the Caribbean SIDS, United Nations Agencies, and regional non-governmental organisations. It brought together 42 participants from sixteen countries. The participants represented a broad range of societal stakeholders in Caribbean SIDS, with representatives of governmental departments and agencies, intergovernmental organizations and United Nation's agencies active in the Caribbean, regional and local non-governmental organizations, businesses and academia. Collaborating with the governments and NGOs in the SIDS and participating in their efforts to implement the 2030 Agenda is a novel avenue for those providing Earth observations to better understand what ocean observations are required and what products are available to inform decisions. The workshop facilitated a dialogue between the governments and people of the Caribbean SIDS, regional organizations, and experts about ways to facilitate progress with knowledge. This dialog benefited from having a very diverse audience comprised of many different organizations, private, public, and governmental. One of the great benefits was that it was not overwhelmed by one type of representative. The workshop structure followed a design-based approach to participatory modeling. It starts with a community agreement on the challenges and the goals that are to be reached, and identifies the knowledge needed to make progress toward these goals. Agreeing on specific targets to reach and indicators to measure progress provides a basis for identifying those social, economic and environmental variables that need to be monitored. For these variables, requirements for the monitoring can be specified, and these requirements can then be matched with existing observations and data products. In cases where a matching is not possible, gaps can be identified. The opening session introduced the view of key stakeholder sectors (governments, scientific experts, earth observation providers) on the challenge of implementing the 2030 Agenda. The following two session introduced the approaches taking in different SIDS, and the interdependencies of the large set of goals, targets and indicators. The next three sessions were intended to progress through the identification of the variables to be observed, the specification of observational requirements, and the matching of these requirements to available products. The final session provided a summary and an outlook on next steps. Within the sessions, presentations of different stakeholders and panel discussions were combined with table discussion rounds and matching group discussions. The presentations provided overviews of efforts made by the different stakeholder groups. The panel discussions combined brief presentations of the panelists and discussions of the panels with the participants. In the two table discussion rounds, the participants split up into five groups discussing table-specific topics. For each round, a round-specific set of questions had been prepared to be considered by each table. The fieldtrip had the goal to introduce the participants to three specific issues related to SDGs, namely the role of private businesses in addressing invasive species such as the lionfish, the role of NGOs in promoting the preservation of ecosystems, including the prevention of plastics and other pollution, and efforts to enable a transition to an organic agriculture. For each session, the participants were asked to submit so-called 2+2 Forms, in which they were asked to identify two points that under each of two headings. The headings related to the topic of the session and in general asked for what was working and what presented a challenge within the topic of the session. A fieldtrip during the first day had the goal to introduce the participants to three specific issues related to SDGs. 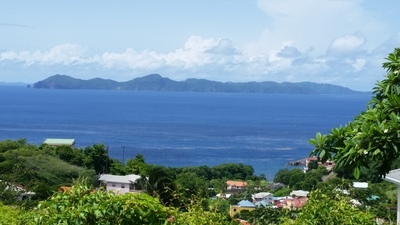 During three site visits, the role of private businesses in addressing invasive species such as the lionfish, the role of NGOs in promoting the preservation of ecosystems, including the prevention of plastics and other pollution, and efforts to enable a transition to an organic agriculture were high-lighted. 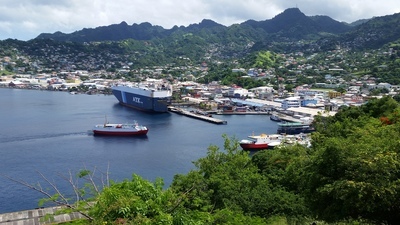 The deliberations emphasized that the SIDS face a set of common threats, including sea level rise, increasing sea surface temperatures, ocean acidification, coral reef bleaching, plastics and micro-plastic pollution, mangrove and sea grass bed disappearance, coastal erosion, invasive species (including Sargassum and Lionfish), damage from cruise ships and intensive tourism, water and terrestrial pollution, land reclamation and conversion, ocean floor and sand mining, onshore development, a lack of sufficient fish stock agreements and treaties and of enforcement, a general decline in health of marine waters and ecosystems. The workshop participants acknowledge that the implementation of the SDGs requires a broad societal effort engaging all sectors and stakeholder groups. Designated “geospaces for SDGs” can provide places where the SDGs can be brought to the people to get their buy-in. Consciousness of the SDGs can be impacted through integrated information. Progress towards the implementation is hampered by a disconnect between theory and implementation and a broken link between scientific expertise and policy-making. Governmental departments often work in silos, which is in conflict with the deeply interconnected nature of the SDGs. The monitoring of progress suffers from complex monitoring requirements and reporting processes, which are not well understood. Throughout the deliberations, the role of an ocean-based economy for the Caribbean and the sustainable development in this region was emphasized by participants. The identification of priority information needs and related essential variables to be monitored and the specification of observational requirements for these variables during the workshop reached only a very initial stage. This hampered the effort of matching requirements to products at the workshop and will be further developed in a white paper on the role of the ocean for SDG implmentation and monitoring in the Caribbean SIDS. The participants assessed the attempted matching as very valuable and identified the need to link the pre-matching steps better to the matching. Among others, follow-on activities to further develop the concept of the geospace and to support the establishment of pilot geospaces in Caribbean SIDS were recommended. The geospace was identified as a potential demonstration project to illustrate the value of Earth observations as part of integrated information at the local scale. Pilot projects were recommended that would tailors information products related to sargassum and oil spill monitoring and forecasting to the specific needs of the Caribbean SIDS and improves accessibility and usability of these products. The implementation and monitoring of the seventeen Sustainable Development Goals (SDGs) of the United Nation 2030 Agenda for Sustainable Development pose socio-economic and cultural problems to society that are difficult or nearly impossible to solve because of incomplete or contradictory knowledge, the number of people and opinions involved, the large economic burden associated with progress towards a solution, and the interconnected nature of these problems with other problems. The challenges faced by Small Island Developing States (SIDS) in the execution of the 2030 Agenda are closely linked with the ocean surrounding these states. Human interactions with the Earth’s life-support system have impacted the physical, chemical, and biological state of the ocean and triggered distinct trends in the ocean system and its functional position in the Earth’s life-support system. The trends in marine ecosystems, ocean circulation, the global water cycle, and sea level have many impacts on human communities and influence progress towards most of the goals. For Small Island States, the changing ocean poses a complex challenge, and many of the observational requirements will be related to the changing ocean. In a collaborative effort of GEO Initiatives, governments of the Caribbean SIDS, United Nations Agencies, and regional non-governmental organisations, a workshop was organized that brought together stakeholders engaged in the implementation and monitoring of the SDGs in the Caribbean SIDS with the goal to link these efforts to required ocean observations and to engage in the co-creation of the knowledge supporting these efforts. Collaborating with the governments in the Small Island States and participating in their efforts to implement the 2030 Agenda is a novel avenue for those providing Earth observations to better understand what ocean observations are required and what products are available to inform decisions. These requirements, where possible, were matched to existing data sets and services to create the knowledge needed by the governments and the people in the Caribbean SIDS, and gaps were identified and addressed where such products do not exist or were not accessible. The workshop utilized a design-based approach to participatory modeling, which starts with a community agreement on the challenges and the goals that are to be reached, and identifies the knowledge needed to make progress toward these goals. Agreeing on specific targets to reach and indicators to measure progress provides a basis for identifying those social, economic and environmental variables that need to be monitored. For these variables, requirements for the monitoring can be specified, and these requirements can then be matched with existing observations and data products. In cases where a matching is not possible, gaps can be identified. Consistent with this approach, the first three sessions introduced the view of key stakeholder sectors (governments, scientific experts, earth observation providers) on the challenge of implementing the 2030 Agenda, the approaches taking in different SIDS, and the interdependencies of the large set of goals, targets and indicators. A fieldtrip during the first day connected the SDGs to local real-world problems. The next three sessions were intended to progress through the identification of the variables, the specification of observational requirements, and the matching of these requirements to available products. The final session provided a summary and an outlook on next steps. Within the sessions, presentations of different stakeholders and panel discussions were combined with table discussion rounds and matching group discussions. The presentations provided overviews of efforts made by the different stakeholder groups. The panel discussions combined brief presentations of the panelists and discussions of the panels with the participants. In the two table discussion rounds, the participants split up into five groups discussing table-specific topics. For each round, a round-specific set of questions had been prepared to be considered by each table. The fieldtrip had the goal to introduce the participants to three specific issues related to SDGs, namely the role of private businesses in addressing invasive species like the Lyonfish, the role of NGOs in promoting the preservation of ecosystems, including the prevention of plastics and other pollution, and efforts to enable a transition to an organic agriculture. The opening session set the stage for the workshop. After welcome notes from the government of Saint Vincent and the Grenadines delivered by the Hon. Saboto Caesar, Minister of Agriculture, Forestry, Fisheries, Rural Transformation, Industry and Labour, and the Group on Earth Observations (GEO) communicated by Dr. Douglas Cripe, the Session featured a number of keynotes providing insight into the interface between science and governance in the Caribbean Small Island Developing States (SIDS) and the particular challenges faced by the SIDS. A keynote reflected on the implementation of the Blue Economy, which seeks to establish a sustainable use of marine resources as a component to the economies of the SIDS. Adopting a Blue Economy was seen as aligned with targets of the 2030 Agenda for Sustainable Development. The final keynote discussed the contribution of Earth Observations to the implementation and monitoring of the SDGs. Session 1 on “The 2030 Agenda for Sustainable Development in Caribbean Small Island States” facilitated a dialogue between governments and people of the Carribbean SIDS about the challenges of executing the 2030 Agenda in each of the SIDS. Linking these challenges to a “geospace for SDGs” implementation brought a local perspective into the deliberations. The first two presentation presented the efforts made by the governments in Montserrat and the British Virgin Islands, and the next presentation gave an overview of the work of a local NGO in Saint Vincent and the Grenadines. Subsequently, the three panelists provided insight into the challenges and efforts from the point of view of UN agencies and regional intergovernmental organizations. At the end of the session, a common understanding of the core problems started to emerge (see next section), and knowledge needs to address these problems were identified. A Field trip brought the participants to three locations including Serenity Dive in Calliaqua, South Coast, Sans Souci beach, and a natural farm at Sans Souci. The fieldtrip illustrate aspects of living on a SIDS and interacting with the Ocean. At Serenity Dive, the participants were introduced to the challenges coastal areas in Saint Vincent are exposed to and the work done in scuba diving courses to raise awareness of the fragility of the marine environment. At San Souci beach, issues with a large amount of waste deposited on the beach by the ocean were pointed out. This waste, which to a large extent consists of many forms of plastics originating in different and often far-away parts of the globe poses risks to the leatherback turtles during their brief visits to the beach for nesting. The visit to the natural farm provided insight in the opportunities this approach to agriculture opens up. On the second day, the program started delayed because a participant delegation had been invited to meet with the prime minister, Hon. Dr Ralph Gonsalves. Initially, the framework for the matching session was introduced. Subsequently, Session 2 focused on “Interdependencies and interactions of SDGs, Targets and Indicators in Caribbean Small Island States.” This session focus on the interconnected nature of the SDGs and the problems presented by SDGs to society, which are characterized by the potentially large economic burden associated with progress towards the SDG Targets, as well as the challenge that those attempting to solve the problem are to some extent causing the problem. In two initial presentations, the interdependencies of SDGs were discussed and a framework for the implementation of SDG 14 was presented. The next presentation provided local examples of issues that hamper preservation efforts. In the subsequent panel discussion, the panelist addressed different aspects of SDG implementation from the viewpoints of trade, GEO initiatives, international science organizations and regional NGOs. The speakers in the session acknowledge that most of the SDGs address the socio-economic and environmental systems based on land, and that both the human and non-human environment in SIDS is crucially dependent on the surrounding ocean. While this dependency is grossly similar it is discretely different in the different SIDS, and both the similarities and differences were elaborated on. After the presentations and panel discussion, the participants then split up for a table discussion round. Five table specific topics were addressed, including (1) Science Support for SIS Governments; (2) NGO and Private Sector Contributions to SDG Implementation; (3) Fisheries, Food Security, and Life Under Water: SDGs 2 Versus SDG 14; (4) Blue Growth and Poverty: SDG 1 versus SDG 14; (5) Education for Sustainability, Justice, and Equality. The outcomes of these discussions were reported back to the plenary. Session 3 considered “Ocean-related variables and indicators essential for SDG implementation and monitoring in Caribbean Small Island States.” and merge existing scientific knowledge with the understanding of the societal problem of making progress towards the SDGs in Caribbean SIS developed in the first two sessions. The initial presentation gave an overview of work done by experts to identify Essential Ocean Variables (EOVs) and showed examples of observation efforts to monitor these variables. The goal was to include those variables and indices that characterizing the physical, chemical, and biological state and trends of the ocean that are essential for both the development and validation of policies in support of SDG implementation and needed for the monitoring of progress towards the targets and more sustainability. Subsequently, a second table discussion round took place discussing five topics, including (1) Supporting a Sustainable Blue Economy - SDGs 8, 9, 10, 12, 13; (2) Food and Water Security, Health, Poverty - SDGs 1, 2, 3, 6; (3) Maritime Transportation, Fisheries, Pollution, Marine Biodiversity - Implementing SDGs 14, 15; (4) Ocean and Safe and Thriving Communities - SDGs 7, 10, 11, 12, 13; (5) Climate Change, Biodiversity, and the Ocean SDGs 13, 14, 15. Again, the outcomes of the table discussions were reported back to the plenary. At the end of the second day, Session 4 focused on “Observational requirements for ocean-related variables and indicators.” The original goal of the session was to develop a set of requirements for high-priority variables that specify the necessary spatial and temporal resolution and coverage, accuracy, and latency that are consistent with what those applications require that could make use of the observations. After an initial presentation introducing the “GEO Blue Planet Initiative,” the following four presentations addressed observational needs in the areas of health and safety, ecosystem health, industry activities, and fisheries. The final presentation provided insight into the role local businesses can play in making progress towards the SDGs. Unfortunately, the time was insufficient to actually compile a list of requirements to be passed on to Session 5. On the third and last day of the workshop, Session 5 made an attempt on “Matching users, requirements and products.” In a novel co-usage effort, the participating experts in Earth observation worked with the stakeholders engaged in SDG implementation to match, where possible, observational requirements to existing data and products. Because there was no comprehensive list of observational requirements, the main purpose of this session was to explore approaches to the co-usage of products and the co-creation of knowledge with these products. Prior to examining potential matchmaking opportunities, the plenary discussed what types of users and stakeholders require data and visualization products in a plenary discussion and broadly grouped them as Decision Makers; Information Providers; Monitoring, Regulation and Enforcement; Educational Institutions; Industry; and Local Resource Users. The importance of a gap analysis was emphasized, and an approach to a thorough gap analysis was reviewed in a presentation by Dr. Plag. The participants then split up into three moderated groups focusing on (1) the knowledge and information needs of decision makers, (2) information providers and (3) those engaged in monitoring, regulations and enforcements. Other main stakeholder groups identified included educational institutions, industry, and local resource users, but the needs of these groups were not addressed. The original goal of these matching groups was to demonstrate the use of the data and products to generate relevant knowledge. However, without a detailed list of observational requirements, the group deliberations focused more on priority information needs and the process of matching. The lack of overall moderation of the previous sessions led to a deviation of the actual session outcomes from those intended and a disconnect between the indiviudal sessions. It was realized that a more “neutral” moderation of the deliberations in previous session by an experienced external facilitator would have been an advantage compare to moderation by either Earth observation providers or societal stakeholders. The absence of a list of observational requirements as input for the matching required to postpone the matching until such a list is available. For the final Session 6 on “Improving availability of Earth observations in service of SDG implementation in Caribbean Small Island States,” the experience of Session 5 provided a basis to discuss options for improving the service Earth observations and derived products can provide to the execution of the 2030 Agenda. Six presentations addressed the questions of how regional an international organizations can collaborate with local and national efforts to ensure that governments and the people have access to the required ocean-related Earth observations and the capacity to utilize these observations for the creation of the needed knowledge. Concerning the local action, the implementation of the geospace for SDGs was at the center of the deliberations. Demonstrating the relevance of Earth-observation derived information for this geospace was identified as the candidate for a demonstration project to be presented to the GEO Plenary in Fall 2018. In two concluding remarks, the participants were urged to stay engaged and contribute to the development of the geospace concept and the implementation of geospaces in the Caribbean. The concept of having a mix of scientists, earth observation experts, and decision and policy makers was appreciated by the participants. It was pointed out that it is seldom the case where either of the two groups have an equal opportunity to dialogue and exchange in formal and informal venues. The deliberations benefited from having a very diverse audience comprised of many different organizations from the private, public, and governmental sector. It was noted positively that the participation was not overwhelmed by one type of representative. Recommendation: It is strongly recommended to replicate the same broad and well distributed diversity of stakeholders in follow on workshops. The design basis and participatory modeling approach for the workshop program was the “goal-based approach” to the identification of essential variables and observational requirements, and the subsequent matching and gap analysis (see section on approach for details). In this approach, each session builds on the outcomes of previous sessions. There were many positive comments on the structure of the workshop program and the underlying design principle. However, there the necessary overall moderation of the workshop and a facilitation ensuring that each session was providing the outcomes required by subsequent sessions was lacking. Instead, the indivdiual sessions were chairded by expert co-chairs, which developed their session to some extent independently of the other sessions. Moreover, a lack of tools to capture the session outcomes in real-time and make them available to the follow-on session resulted in some dupplication of discussions and breaks between the lines of reasoning from workshop start to end. Recommendation: It is recommended that future workshops also apply a “goal-based design” to the program development and ensure the interlinkages between sessions through a coordinated chairing and management of all sessions through an experienced neutral team of moderators. Allocation of time for expert presentations compared to deliberations between stakeholders was also commented on. In most sessions, most of the time was allocated to expert presentations. The panel discussions also did not provide for much of an actual exchange during the formal sessions, as the panelists presented their often extensive material instead of the moderators urging a broader plenary discussion. This led to two parallel set of presentations with very little time for actual discussion. As a result, too much of the time during the moderated sessions was spent on listening to presentations. Participants commented that this was a missed opportunity to have had a more in depth discussion based on the main presentations that preceded the panels. Recommendation: It is recommended that for future workshops experienced but non-expert facilitation be utilized for panels and group discussions and potentially also for plenary sessions. Using experienced neutral panel and group discussion moderators would ensure more time for deliberations as these moderators would not themselves be interested in presenting their work or the work of their respective institutions. Therefore, a neutral panel or single moderator not coming from the two principal stakeholder groups would move some of the difficult discussions that are required to bridge both understanding of the respective constraints of each group and charting a way forward to close the gap in the science-policy domain leading to better decision making based on scientific fact and not conjecture. The table discussions in Sessions 2 and 3 and the matchmaking deliberations in Session 5 were found to be extremely useful and they more closely resembled the expectation of a dialogue between various stakeholder groups. The smaller and more intimate setting allowed for free-flowing discussion around the issues based on the guiding questions that were provided. In most of these smaller group deliberations, the participants were able to identify key needs that SIDS have at a more granular level than what would have been possible during the plenary sessions. In general, the workshop was constrained by time limitations. Had there been more time to develop a common understanding based on the discussion, a likely outcome would have been a more robust set of recommendations that could guide the Earth observation agenda and the need for reform in the science-policy framework and required adoption of recommendations on a recurrent basis. This is the guidance required to improve decision making on behalf of the people of the region. Recommendation: It is recommended to increasing the time that is allotted to deliberations in table discussion rounds and or breakout sessions so that the participants have more time to develop concrete and practical suggestions that would guide where technical, financial and human resources would be deployed in the future. The individual SIDS are making efforts at national level to implement and monitor the SDGs. These efforts are not yet well coordinated between SIDS, and they are negatively impacted by a number of challenges and threads. Regionally, efforts are made by a number of reginal and global intergovernmental organizations to support the SIDs in their efforts. The 2030 Agenda for Sustainable Development has, at its heart, the motto: “Leave no one behind, ” which should form a guiding principle as action plans are developed to strengthening institutional frameworks, embedding recommendations into cabinet policy papers. Common threats faced by the SIDS include sea level rise, increasing sea surface temperature, ocean acidification, coral reef bleaching, plastics and micro-plastic pollution of the ocean, mangrove and sea grass bed disappearance, coastal erosion, invasive species (in particular Sargassum, and lionfish), damage from cruise ships and intensive tourism, water and terrestrial pollution, land reclamation and conversion, ocean floor and sand mining, onshore development, insufficient signatories and enforcement of fish stock agreements and treaties, general decline in health of marine waters and ecosystems. Among the SIDS of the Caribbean, there is limited capacity for data analysis and data sharing and as a result there is a lack of data in support of evidence-based decision and policy-making. Data sharing especially from the private sector (oil and gas companies) is very low. The SDG reporting process is not well understood. A great potential for citizen science exists, especially with respect to in-situ monitoring of the oceans (for example, scuba divers, fishing and other commercial vessels, reporting from NGOs) but tools to utilize this potential are lacking. The small size of the SIDS and their economies poses high costs for public services and governmental activities on the population and economies. Thus, regional coordination of implementation and monitoring of SDGs is crucial to reduce the associated costs. The government ministries across the region are largely operating in silos, and tools for interdepartmental coordination and collaboration are needed. The SIDS need to learn about international/regional/national instruments that could be leveraged, and there needs to be greater public awareness and involvement. Science in support of SDGs in the Caribbean is being done by a variety of organizations; yet there is a disconnect between this science, the government and society. There is a challenge with continuity: when governments change, national priorities also change, and these priorities are not often well defined. Indicators for SDG14 are largely in Tier 3 (i.e., no internationally established methodology or standards are yet available for the indicator, but methodology are being developed and tested and standards will be available in the future). This does not make these indicators very implementable at the present. In addition, they may not be applicable across countries. This requires the need for proxies or analogous indicators. There are conflict between SDG 14 and other SDGs, which in most cases will take priority because of direct human needs. These conflicts are the result of interdependence and interferences between SDGs. For example, SDG 2 can be in conflict with sustainable fisheries. For coastal health (SDG 3), there can be a disconnect between land processes and coastal problems. Data access is still an issue because of data formats or data no being usable, discoverable, or applicable. The value and benefits of the SDGs has to be put in terms of human capital. Valuation of coastal assets has to be done in the language of policy makers; it also has to resonate with people. The term citizen science means nothing to the regular citizen and engaging citizen in scientific efforts requires translation and communication. There is a striking disconnect between scientists and citizens, and scientists who want to engage in SDG implementation need to bridge this disconnect. A large gap exists for urgently needed integrated environmental and socio-economic databases. There was clear request for more scenario-based modeling in support of policy making. The scenario-based model outputs exploring proposed policy impacts should be available to inform decision and policy making. The need to package the information from such modelling into a language decision-makers can understand and utilise was recognized. The use of satellite observations in combination with artificial intelligence for maritime monitoring was considered important particularly for SDG 14 implementation. Equally important is the need for data to be provided in resolutions meeting the needs of local situations and capacities. The complex SDG interlinkages require considerable capacity enhancement at national and regional levels, and there is a need for knowledge sharing across governmental departments and between the SIDS in the region. The role of ECLAC for knowledge sharing across the region was emphasized. Recommendation: It is recommended that a workshop be organized under the lead of ECLAC to develop a knowledge platform on land, water, and ocean governance and the linkage with poverty and livelihood sustenance. Given the different interpretations of poverty and the region's predisposition to disasters, defining poverty in each of the SIDS is an important task. Identifying which SDG targets can set criteria for poverty in each country and identifying what national plans exist to respond in the different sectors (for example, considering vulnerabilities and relationship with the ocean as well as resilience to climate change) would be another important outcome of the workshop. It was suggested to identify 'SDG champions' at the national or individual level and thus put a face on prioritized SDGs to which the people can have a connection. Currently, there is a disconnect between SDGs and people and the goals are not something tangible. While there are efforts that already exist in terms of localization of SDGs and connecting SDGs with communities, little has been done at the SIDS level. A valuation of natural capital including ecosystem services needs to be done to put this capital in context for decision makers and the population. Scenario-based planning may provide an opportunity to visualize what different avenues of change may result in. However, scenarios have to be tailored to local conditions. There is a lot of regional complexity and heterogeneity, and this constitutes the need of an overarching coordinating mechanism, such as ECLAC does for economic development. National and regional interfaces that promote interaction between countries are needed. It was considered important to reach out to international companies which deliver and transport products to SIDS to promote responsible practices. For example, products wrapped in plastic contribute to plastics pollution and a reduction of plastic is needed, as there is no recycling facility anywhere in the Caribbean islands. The question was posed whether a regional recycling facility could be installed. It is important to sensitize the population to the problem and provide alternatives. The alternative has to be sustainable. Strategies need to be developed to sensitize the population for the challenges to the SDGs and raise awareness of the SDGs. Examples mentioned including races or events to educate the public. An overwhelming percentage of the world’s population still doesn’t know that the SDGs exist and efforts are being made to reach them. Utilize impact and evidence-based examples that demonstrate the day-to-day relevance down to the individual level affecting everyone is of importance. A lack of implementation was detected. The implementation process has to be bottom up and voters have to create the pressure on the politicians, and for this the people have to understand the needs and identify with them. It was suggested to use local talents to promote awareness (for example, a local artist could draw logos). There is a need to build a feedback tool for reporting on success stories and support capacity building. It was suggested that GEO could have a role in this. Human capital needs to be at the center of the SDGs. Ties that exist locally and internationally should be strengthened. Many of the SDGs require international cooperation because the challenges often arise outside individual SIDS or implementation requires regional actions. Many of the SDG indicators mean nothing to the individual SIDS or may not be applicable. In these cases, the question is what proxies can provide similar or analogous information. Implementing the required change can be hard, especially when they are in conflict or contradicting tradition. Finding ways that respect traditions while promoting change is a challenges. It was considered important to involve communities from the start and to respect that communities don't want to be told what to do. SDG implementation has to start at the small scale. These points are in strong favor of the geospace approach. Funding for SDG implementation is an issue, and funding from governments is almost nonexistent. A compelling economic case has to be made for sustainability through time. In other parts of the world, businesses are already involved in SDG implementation and also in following more sustainable practices. Examples from these models could be transported to the SIDS and adapted to their needs. Data has to be fit for purpose. This implies that costs to collect, manage and administer have to be low, and the data to address the needs of the target community. An example of fit-for-purpose data focused on land pointed out is the fit-for-purpose land administration guiding principles for country implementation by Enemark et al. (2016) available as pdf. How easy is it to find and engage local scientists, artists, and other human capital by outside entities to encourage the use of local resources and promote awareness? What is the value of the natural capital to the average person? This needs to be defined. Capacity building is needed, but what type? Who needs it? What happens after training? How far does capacity building go when the infrastructure is not there? There is a question about the usefulness of training in developed countries, and applicability of that training when trainee returns home. What are the reasons that are hindering progress towards the goals? How can the people be connected better to the national efforts? How can the lack of data be addressed? How can data sharing and data access/sharing be promoted in the region. What is necessary to enable data sharing without compromising sensitive information? The expert-based approach to essential variables has led to a well-developed set of Ocean Essential Variables (EOVs). However, the link of these EOVs and their suitability for the SDG implementation and monitoring has not been assessed in detail. Data that support the quantification of indicators should have priority. It was emphasized that there is a need for socio-economic data, particularly those data that help to understand the economic value of the marine data, which is relevant to eco-system based management, eco-system health and natural capital valuation. For poverty and health, socioeconomic analyses are needed. For health, transdisciplinary linkages are important to answer questions such as when are people getting sick and what they are doing. The absence of data could inhibit decision making, as politicians may use it as an excuse not to make decisions. There is a need to identify the purpose of data. An important purpose is safeguarding human health. This needs baseline pollution data, and impact data that is region specific. As a result of the workshop deliberations, the need for more work on identifying a prioritized set of essential variables for SDG implementation and monitoring was confirmed. Likewise, developing a set of observational requirements for these variables is a task largely remaining to be done. The match-making session was considered a key part of the workshop. The main outcome of the session was an assessment of the approach used. As mentioned above, the participants were split up into three groups addressing the knowledge and information needs of (1) decision makers, (2) information providers and (3) those engaged in monitoring, regulations and enforcements. In hindsight, the splitting up of the matchmaking groups according to stakeholders was a diversion from the goal-based approach of the workshop, which would have used sets of essential variables and associated observational requirements in an attempt to match these requirements to products. In the three matchmaking groups the stakeholder groups focused on were not well represented and could not clearly specify the variables essential for them or the observational requirements. Ideally, the basis for the matchmaking would have been a list of observational requirements for a subset of the essential variables. This list would have been used in either a market place setting or a country-specific grouping. For the market place setting, stakeholders associated with specific requirements would have moved through different provider tables to find products meeting their requirement. For a country-specific approach, representatives of countries would have taken their set of observational requirements to different providers to discuss options for products that would meet their requirements. The matching deliberations in the three groups had no clear requirements to match against products. Therefore, much of the discussion remained at a very descriptive level and did not result in actual matchmaking. To some extent, countries were able to highlight areas that needed response. It was found important that there is a focus on enabling countries to identify how they will undertake their monitoring, which is their responsibility and they need to define what can work in their own contexts. It would have been helpful to have concrete partnerships identified from the groups where actors responsible for monitoring indicated what or with whom they would like to pursue further discussions. The development on information products for the regions was discussed to some extent. The need for pilot projects tailoring existing Earth observation products to the needs of policy and decision makers in the Caribbean SIDS was recognized. Such project could demonstrate the value of the products and increase their accessibility and usability. Recommendation: A pilot project should be set up that tailors information products related to sargassum and oil spill monitoring and forecasting to the specific needs of the Caribbean SIDS and improves accessibility and usability of these products. The concept of the geospace for SDGs as a place where hands-on practices for the implementation of the SDGs can be developed and validated was supported by the workshop participants as a means to demonstrate that the implementation can be done over a large space. It was underlined that implementing the geospace first in Saint Vincent and the Grenadines and then in other locations in the Caribbean would make the region a voice of all SIDS in the world. Recommendation: It is recommended that national and international stakeholders engage in the further development of the geospace concept and support the implementation of a first such geospace in Saint Vincent and the Grenadines as a joint state-based and grass-roots effort. Recommendation: It is recommended that a follow-on workshop be organized to further detail the geospace concept, information needs, and practical approaches. A core principle for the geospace is the creating of consciousness of SDGs in the population through integrated information supporting actions. Working out specific examples of how Earth observation data can support implementation of SDGs at Goal or Target levels and inform policies would be beneficial. The importance of regional collaboration and coordination was emphasized throughout the workshop. The list of regional organizations engaged in aspects of SDG implementation and monitoring is long and there is a need to improve coordination and the flow of information between these organizations and the SIDS. A web-based facility linking all activities and enabling knowledge sharing was considered an important step towards improved coordination. The need for a better linkage between science, research and monitoring activities in the region and improvements of the interface to decision and policy making was also identified. A joint platform to facilitate this linkage and interface would be an important activity. Building this around several geospaces in the Caribbean should be considered in the development of the geospace concept. It was noted that the majority of the Caribbean SIDS are not members of GEO. It was found that GEO could provide valuable support to the Caribbean SIDS. It was recommended that the SIDS consider potential benefits for them in joining GEO to leverage the convening power in tackling the many issues outlined during the workshop. In particular, the fact that ECLAC is a Participating Organization in GEO could be utilized in the further development of the geospace. A greater participation of the SIDS in AmeriGEOSS should be encouraged. The formation of a CaribGEOSS might be considered. For the development of the Geospace for SDGs, participation of GEO Initiatives is highly valued and needs to be facilitated. It was also recommended that the CEOS Open Data Cube (ODC) at the regional level would be explored as an option to be utilized for the geosapce. 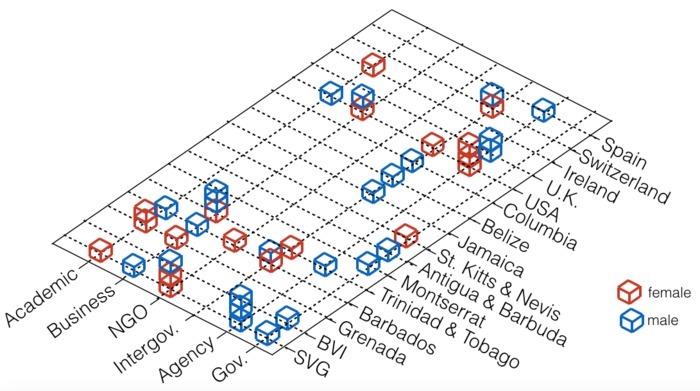 For the Caribbean SIDS, it would be of value if a best practices should be established of how GEO Members are reporting against the SDGs (which ministries, what process, how tier elevation works) and how they are utilizing Earth observations in their reporting. It was found that help is needed in the region and at national level with issues such as maritime security. The potential role for GEO to play in supporting the implementation of geospaces with Earth observation should be investigated and a demonstration project to be featured at the GEO-XV Plenary should be developed. The question was raised whether AmeriGEOSS and GEO could play a role in facilitating regional platforms to aggregate and easily distribute fit-for-purpose data. This should include practices to visualize data and support to ensure that products reach communities. Supporting the development of a CaribGEOSS could be an important step towards this goal. Concerning the reporting on SDGs, it was discussed that a 'Country Status Report' should be developed that identifies knowledge, information and data needs for each SIDS and thus accelerates a demand-based pull component and not the current technology-based push component. There is a need to understand at what level the countries receive science support, what their capacities and where there are gaps. The 2+2 Forms submitted during the workshop can help to populate a first version of such reports. However, there is a need to follow-up with a request for a brief “Country Status Report.” Each SIDS could quickly put together a report, in which the current monitoring structures are described. The report should provide information on the monitoring level aspired for, the variables being monitored, the available tools and information, the challenge areas that need support, and what kind of support or tools are needed. The report also should provided “data about data” and assess what data exists and its quality and how it is managed and accessed. Questions to be addressed include: Is there a constitutional right to make available public information? If new data sources are needed, can these be secured and is there an enabling environment for this within the country and between countries? The report also would identify each SIDS' national priorities and indicate the status of the existing ecosystems and services that support the relevant sectors (including marine and fisheries but also water-use and land-use sectors). Where are sector data and how are they accessed? Are there mechanisms for cross-sector sharing? The report should include list of studies undertaken including known impact studies and stock-taking exercise. If possible, the legal and policy instruments governing the management and regulation aspects should be listed. An effort should be made to find funding to do an exhaustive review of the international, regional, and national instruments, as well as national plans. An assessment of the implementation mechanisms, planning, monitoring should be carried out. This should include the trading agreements or frameworks regionally and in each country, as well as the frameworks for sharing information and for technology transfer. In following up on the matching session, it would be important to ask the representatives of the countries to provide quick summaries of which aspects of the monitoring they felt their countries need support for. They should indicate specifically what kind of tools and systems they felt could be useful for them to address these needs. Recommendation: It is recommended to develop a template for a “Country Status Report” considering the specific challenges of SIDS and to ask the governments of the Caribbean SIDS to prepare these reports for further analysis to improve the science, earth observation and knowledge support they need to achieve the SDGs in their country. Recommendation: It is recommended that the synergies among SDGs be further explored via evidence-based examples (positive and negative). Recommendation: It is recommended that relevant partner join in an effort of developing a feedback tool for knowledge-sharing concerning implementation efforts and solutions as a means to support capacity building. There is a need to focus on capacity building in the region and in sensitizing communities to the SDG's and their importance to their daily lives, and the geospace is an important action to address this. There is a need to develop national frameworks for monitoring and evaluation of SDG indicators, and the SIDS are in need of support for this. Particularly for the Type III indicators support is needed and international effort on these indicators should be urged to demonstrate the application of satellite data using demonstration sites in the Caribbean SIDS. A regional framework for the SDG 14 indicators should be developed. Scientists and researchers need to be 'educated' in government policy-making mechanisms to better understand how their research can inform better policymaking. Regional institutions could facilitate this education. The workshop was organized in a broad collaboration of GEO Initiatives, governments of the Caribbean Small Island Developing States, United Nations Agencies, and regional non-governmental organisations. 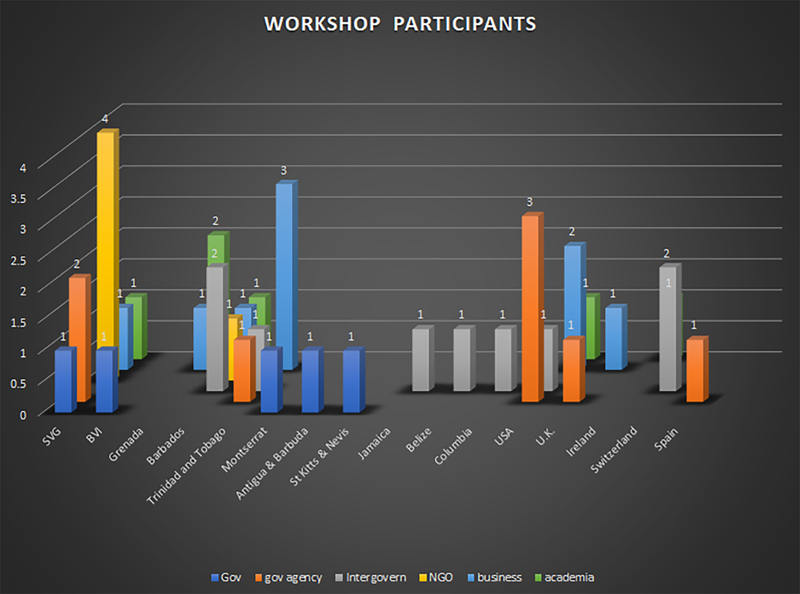 The workshop brought together 40 participants from sixteen countries, and two additional participants contributed remotely to the workshop. The participants represented a broad and diverse range of stakeholders engaged in the implementation of the SDGs. Evans Alan Head, International & Strategic Partnerships & Marine Science Policy Adviser International and Strategic Partnerships Office, National Oceanography Centre, Southampton Southampton U.K.
Roberts Julian International and Strategic Partnerships Office, National Oceanography Centre Southampton U.K.
Co-Chairs: Dr. Hans-Peter Plag and Danielle Evanson. The opening session introduced the different parts of the workshop with brief keynote presentations on the view of the governments on SDG implementation and monitoring, the view of NGOs on the efforts made to implement the 2030 Agenda, and the potential contributions providers of EO-based products can make in support of the governmental and non-governmental efforts to implement and monitor the SDGs. Co-Chairs: Jai Rampersad, Dr. Julian Roberts. This session facilitated a dialogue between governments and people of the Carribbean SIS about the challenges of executing the 2030 Agenda in each of the SIS. Linking to “Geo space for SDGs” (GSSDG) for the implementation brought a local perspective into the deliberations. The first two presentation presented the efforts made by the governments in Montserrat and the British Virgin Islands, and the next presentation gave an overview of the work of a local NGO in Saint Vincent and the Grenadines. Subsequently, the three panelists provided insight into the challenges and efforts from the point of view of UN agencies and regional intergovernmental organizations. This session addressed the wicked problem presented by SDGs and focus on the interconnected nature of the SDGs and the potentially large economic burden associated with progress towards the Targets, as well as the challenge that those attempting to solve the problem are to some extent causing the problem. In a transdisciplinary dialogue, the role of the ocean for the interconnected SDGs was characterized taking into account the many interdependencies between the SDGs. The session considered that most of the SDGs address the socio-economic and environmental systems based on land, and that both the human and non-human environment in SIDS is crucially dependent on the surrounding ocean. While this dependency is grossly similar it is discretly different in the different SIDS, and both the similarities and differences were elaborated on. The goal was to identify those applications and tools that are used in generating knowledge addressing the interdependencies across boundaries between SDGs, government departments and societal sectors. This session aimed to merge existing scientific knowledge with the understanding of the societal problem of making progress towards the SDGs in Caribbean SIS developed in the first two sessions. The goal of the session was to use the knowledge needs identified in the first two session to co-create a prioritized inventory of those ocean-related variables and indicators that can inform the development and validation of sustainability policies in the SIS, and can help to engage the people in the implementation of these policies. The inventory aimed to include those variables and indices that characterizing the phycial, chemical, and biological state and trends of the ocean that are essential for both the development and validation of policies in support of SDG implementation and needed for the monitoring of progress towards the targets and more sustainability. The initial presentation gave an overview of work done by experts to identify essential ocean variables and showed examples of observation efforts to monitor these variables. Subsequently, the a table discussion round took place. In a novel co-usage effort, the participating experts in Earth observation worked with the stakeholders engaged in SDG implementation to match, where possible, observational requirements to existing data and products. The main purpose of this session was to explore approaches to the co-usage of products and the co-creation of knowledge with these products. The participants were split into three moderated groups focusing on the knowledge and information needs of decision makers, information providers and those engaged in monitoring, regulations and enforcements. Other main stakeholder groups identified included educational institutions, industry, and local resource users, but the needs of these groups were not yet addressed. The orginal goal was to demonstrate the use of the data and products to generate relevant knowledge. In cases were no matching products were known, the goal was to indicating gaps in obervation, processing or capacity. The group deliberations focused more on the process of matching that the actual matching. It was also realized that a more ``neutral'' moderation of the deliberations by experienced indepedant moderators would have been an advantage compare to moderation by either Earth observation providers or societal stakeholders. Co-Chairs: Dr. Douglas Cripe and Dr. Hans-Peter Plag. The experience of Session 5 provided a basis to discuss options for improving the service Earth observations and derived products can provide to the execution of the 2030 Agenda. The main questions addressed was how regional an international organizations can collaborate to ensure that governments and the people have access to the required ocean-related Earth observations and the capacity to utilize these observations for the creation of the needed knowledge. Concerning the local action, the implementation of the Geo Space for SDGs was at the center of the deliberations. Demonstrating the relevance of Earth-observation derived information for this Geo Space was identified as the candidate for a demonstration project to be presented to the GEO Plenary in Fall 2018. A matching framework was proposed by Dr Emily Smail prior to the workshop. This framework distinguishes three levels for available products with a color-coding of green for mature products, yellow for pilot projects, and red for concepts. Mature Data, tool, service or product is the correct type for meeting user needs and is implemented in a way that meets user needs. Data, tool, service or product is available for the required geographical region Data, tool, service or product is available at the required temporal & spatial resolution. Data, tool, service or product is processed and visualized in a way that meets user needs. Data, tool, service or product is available in a way that meets user needs (e.g. openly available via web portal). Pilot Data, tool, service or product is the correct type or partially meets type need for meeting user needs and/or is not implemented in a way that meets user needs. Data, tool, service or product is available for a portion of the geographical region Data, tool, service or product is available but not at the required temporal & spatial resolution. Data, tool, service or product is available but not processed and visualized in a way that meets user needs. Data, tool, service or product is available but not easily accessible for users. Concept Data, tool, service or product type and required implementation mechanism has been identified. Need for data, tool, service or product for a geographic region is identified. Required temporal & spatial resolution for data, tool, service or product identified. Required processing and visualizations identified. Required availability of data, tool, service or product identified.